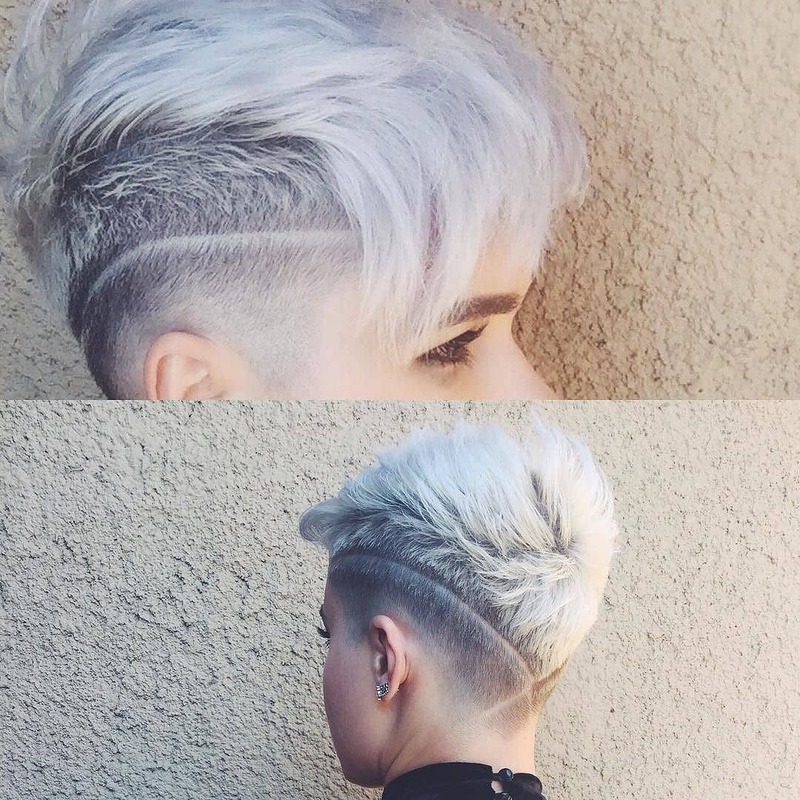 An undercut pixie haircut‘s a great way to get an instantly trendy look, without having to invest in lots of new clothes! 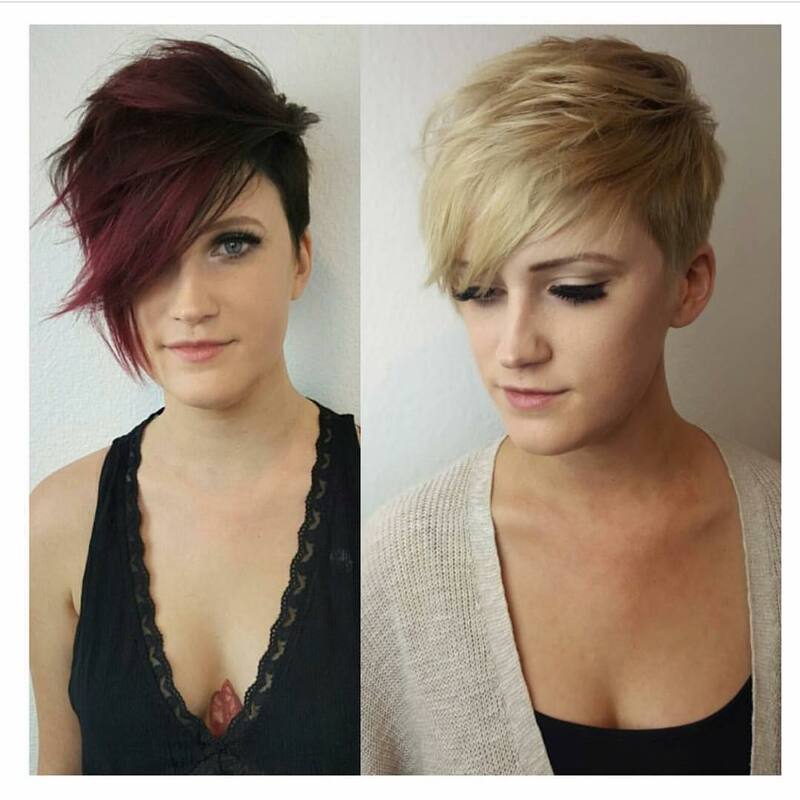 These cool pixies will give you a super, new image and an easy-care haircut that’s totally up-to-the-minute in cut, color, texture and finish, so come on in! 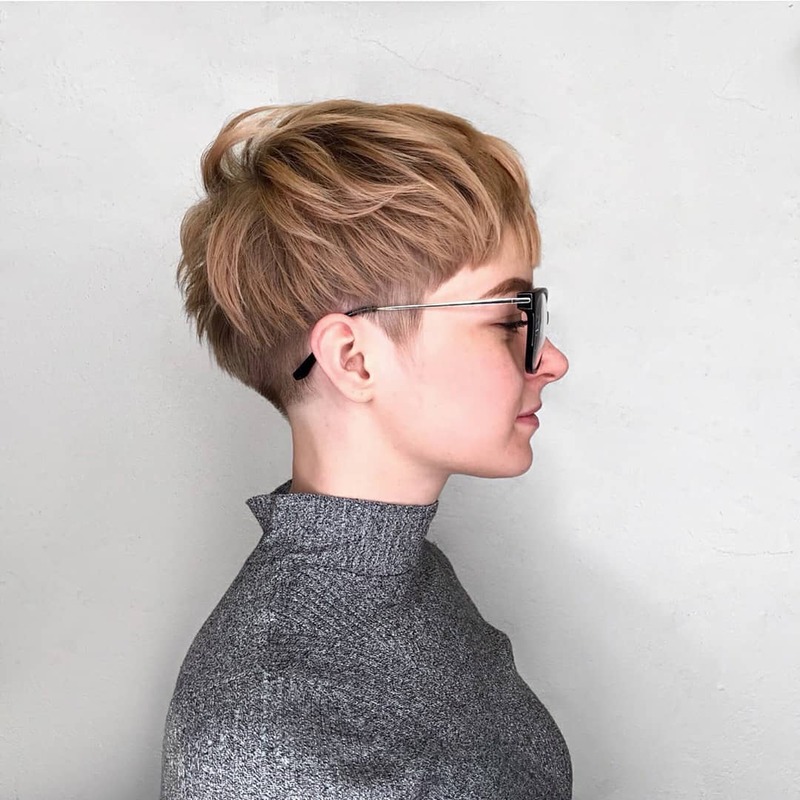 Although the back and sides are shaved in this fashionable pixie hairstyle, the final look is softened by the pretty shade of light-golden-blonde. 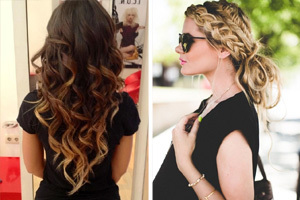 Golden blonde colors suit skin with warm undertones, and this holds true if your skin is light or dark. Shaves sides allow you to show-off a dainty tattoo behind one ear, which also softens the line. The top has short layers around the crown for added volume. And the top has longer layers and a straight-across fringe reaching the eye-brows, with a clear profile! If you like a natural beauty look, but have mousey hair, why not try this pretty balayage to add some fashionable color? The cut is a neat and tidy look with well-defined side points reaching half-way down the ear. And there’s a trendy V-shaped line at the nape, beneath longer layers styled to produce an attractive curve at the crown. The hair is styled forwards and swept to one side in a softly draped long fringe. But it’s not complete without the gorgeous triple-blonde balayage in neutral, copper and pink tints that adds a chic finish! 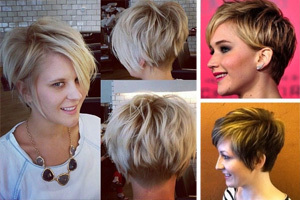 Here’s a fabulously modern version of the original short pixie cut. 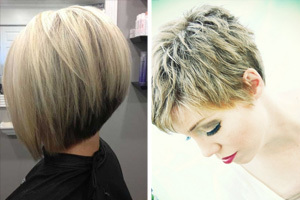 The roots are soft, medium-gray and the tips are highlighted in trendy ash-blonde. 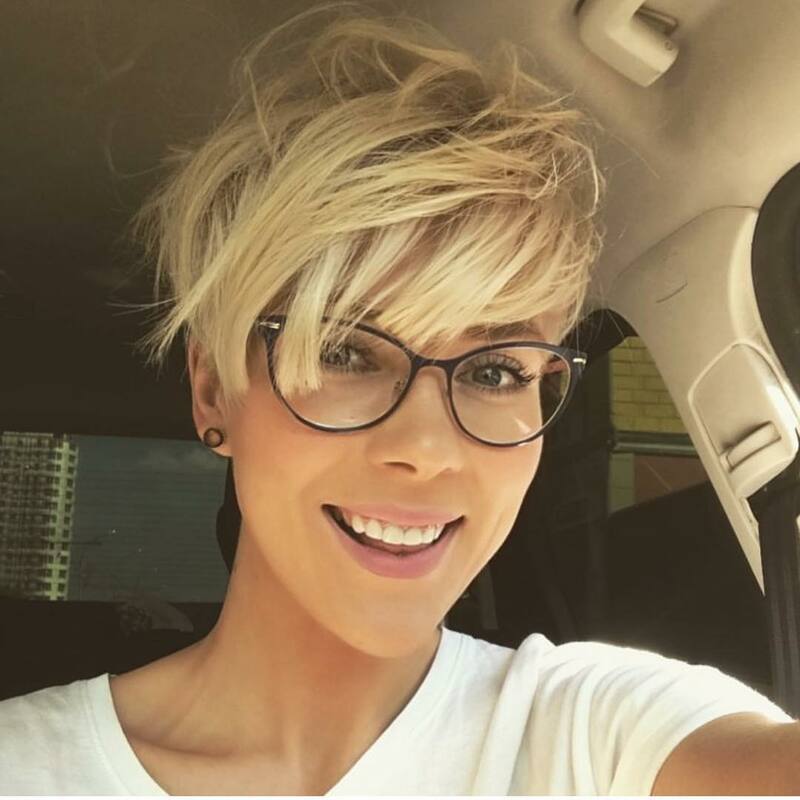 This is a good short haircut to choose if you have fine hair, as lots of layers create attractive, ruffled texture you can style in any direction. 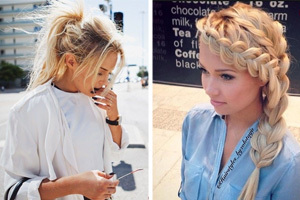 There’s something distinctly cute and kittenish about this hairstyle and it suits oval, round and other face shapes. The extra-short fringe and height on top make round faces seem longer. Not suitable for a long, narrow or a heart-shaped face. 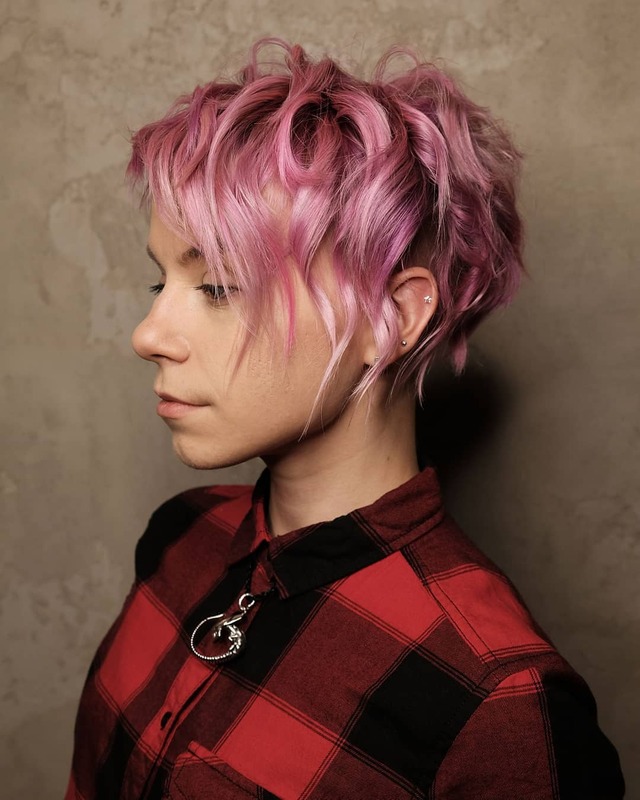 Here’s an interesting take on the cute, pink short haircut, because it’s breaking all of the common ‘fashion and hairstyle rules’! The layered haircut has a shaggy finish, with sharply tapered tips contrasting with the wavy texture above. And the expert colorist has used 3 or 4 different shades of pink to create extra color depth, through varied light and shade. The tips are highlighted in pale, shell-pink blonde and the hair is styled with a trendy, vertical part showing the ear and ear-rings. Worn with a red, checked blouse this cut-and-color is a real trendsetter! Now that 60’s style dark-framed glasses are fashionable, they’ve become a popular alternative to contact-lenses for some trendy gals. And you need to take your spectacles into account when getting your haircut. 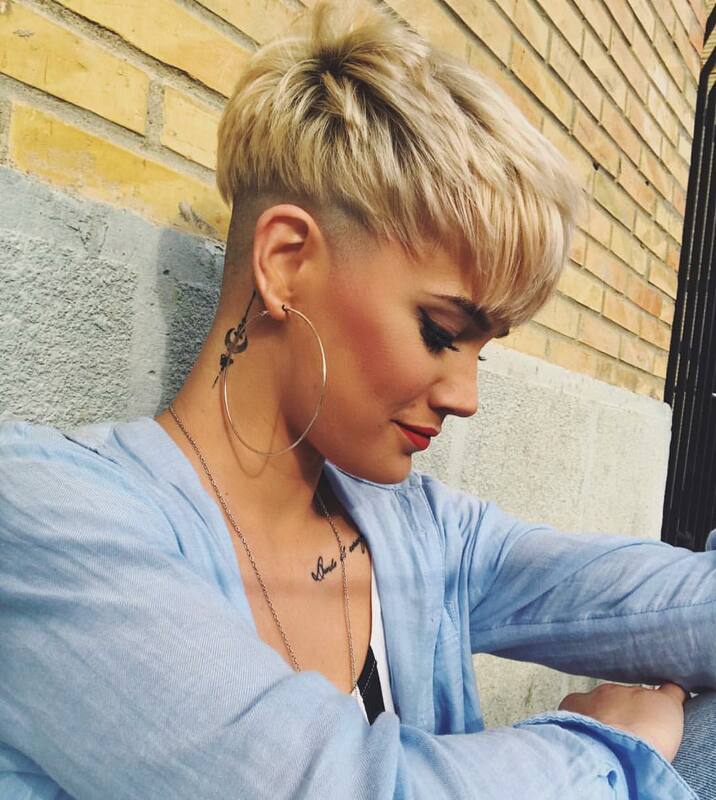 This casually, ruffled swept-over pixie haircut balances the dark-frames perfectly to avoid a severe look. In a natural-looking pale-golden blonde shade, this model’s skin-tone is complemented. And her glasses, and haircut with blunt-cut tips for added density, work together to give a long face shape a more ‘oval’ aspect! 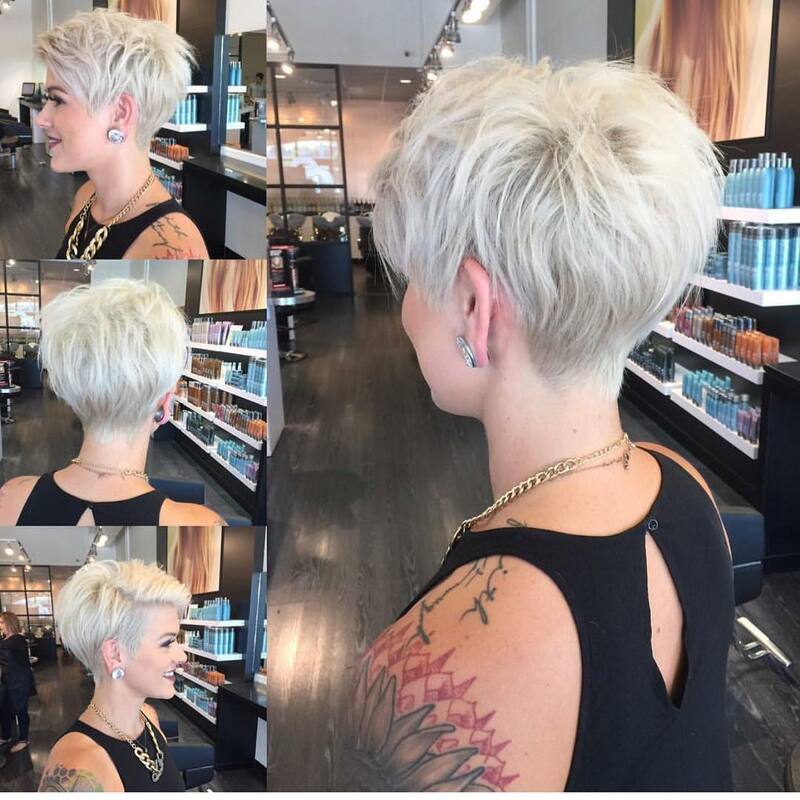 This pretty white-blonde short pixie haircut is eye-catching for its color, but kept fairly simple as far as styling is concerned. And that’s important when you have brightly colored extensive tattoos showing. It’s vital to ensure that these two focal points aren’t ‘fighting’ with each other for attention. Thed red tattooing is nicely balanced by ash-blonde hair, with soft, dove-gray roots. 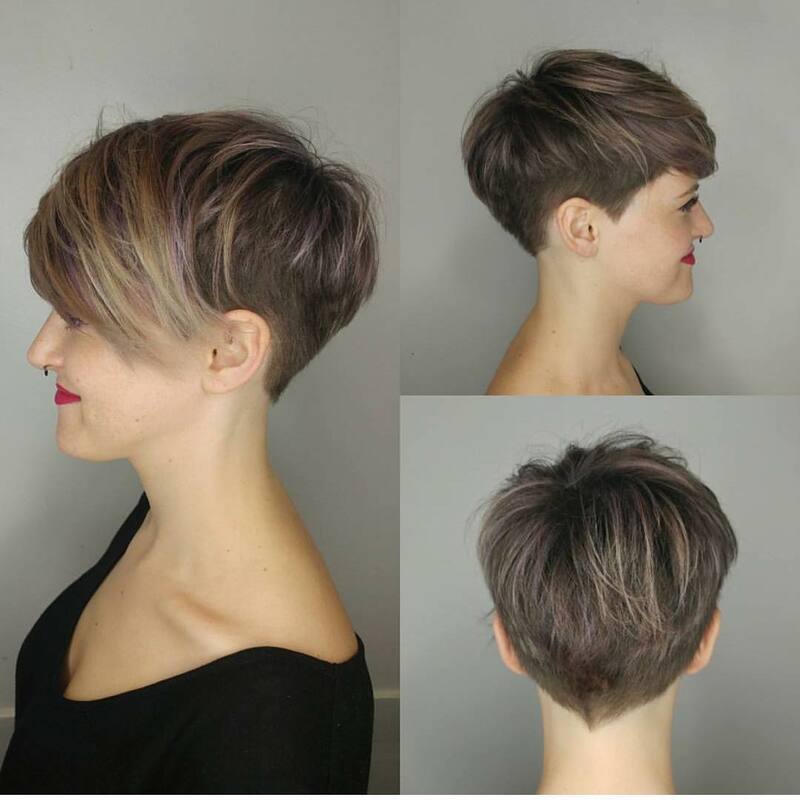 The shorter side of this asymmetrical pixie haircut is undercut showing pale, not dark, roots. So the look is edgy, but not harsh in any way! If your hair is thick and coarse, you’ll be able to wear a short haircut at the back with an extra-long fringe contrast. The rich red-brown shade of the brunette style complements the model’s lovely, red tattoo design perfectly. But if your hair is fine and silky in texture, a shorter multi-layered haircut will be easier to style. 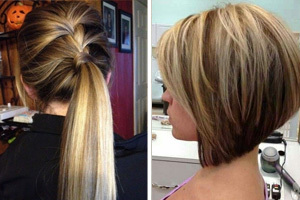 Both of these asymmetrical short cuts have a fashionable contrast between long, ruffled layers and a neatly-cut short side. The brunette style is perfect for disguising a long, narrow face! These cool colors plus an ultra-modern, boy-cut hairstyle could be the image of a new, super-hero tv series called Silver & Steel! This boy-cut will accentuate your femininity in a very stylish way. The hair is cut in a short-back-and-sides with distinctive curved, shaved lines converging just above the nape for a totally new look. The back has a V-shaped section and the sides have several different textures arranged in a ‘fade’ ending in shaved side points. 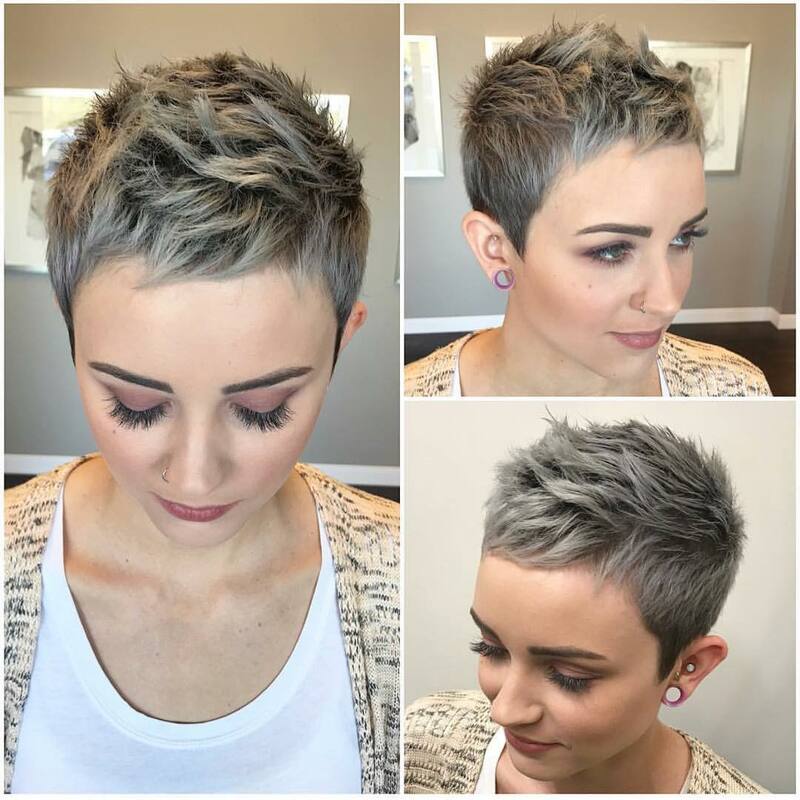 The hair is styled forwards with face-framing bangs and highlighted with ice-blue blonde over steel-gray roots! Here’s another great short haircut idea for those of us who like to wear fashionable frames. Red frames are a statement look and you’ll get the best effect if you match your lip-color to the same shade of red. The sides of this model’s glasses are white, which is complemented by the cool white-blonde shade of her hair and gray roots. As the frames are large and squarish, the hair is given a feathered finish with long, tapered tips to soften the lines, whilst keeping the look ‘edgy’. This lovely shade of hazel-nut blonde is a flattering color bridging the gap between blonde and brunette. 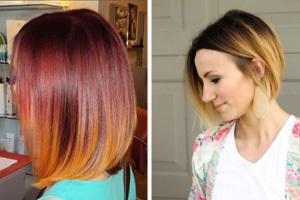 It’s a trendy choice for anyone with dark-blonde/mousey-brown hair who wants a bit more color. The basin-cut style has strong lines from the layers that follow the shape of the head down to the nape. 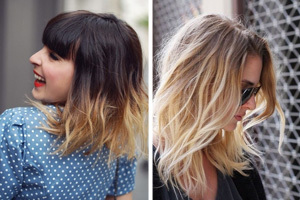 But the tousled texture on top creates a lovely, casual vibe before the short fringe and extra-short side-points. This color lightens the model’s look and balances well with dark-framed spectacle frames.